Navigating the ever-growing number of microbrands in the watch market these days can feel a bit like a dense dark forest. Further, when it comes to picking a single watch out from the tremendous number of homages, Kickstarters and remakes, it’s downright disorienting. 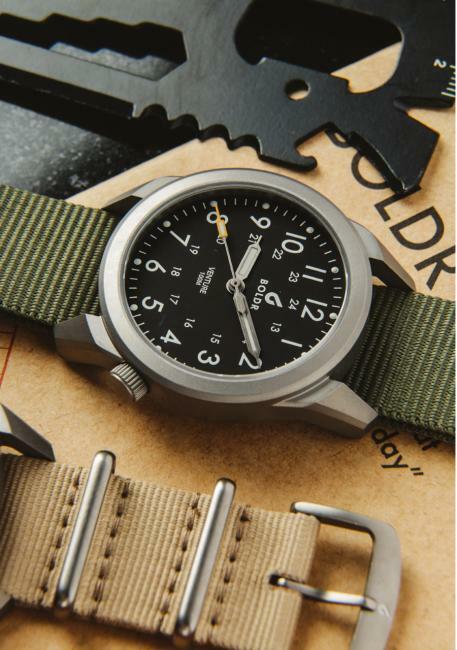 Luckily, BOLDR Supply Co is looking to guide watch lovers out of the proverbial woods with their new take on the classic field watch. The new BOLDR Venture was designed to deliver toughness, practicality and wearability at a highly affordable price point for the ultimate beater. BOLDR is a self-proclaimed maker of watches for “modern-day urban adventurers” and the aptly named Venture is a pure embodiment of this raison d’être. On one hand, the Venture carries on the traditional elements of the archetypal field watch: hyper-legible matte black dial with no date, large lumed Arabic numerals and indexes, 24hr scale, lumed syringe-style hands, tough matte case and ballistic nylon strap (in classic khaki green, beige or black). On the other hand, BOLDR has subtly equipped the Venture with modern features and signature flourishes: aerospace grade titanium case at 38mm diameter and 11mm thick, Zulu style strap with solid titanium hardware, 100m water resistance, comfortable 4 o’clock crown placement, flat anti-reflective sapphire crystal custom engraved casebook and BOLDR’s signature angled lugs. I personally love the splash of orange on the flag-shaped seconds hand that prevents the watch from being overly staid and sterile. BOLDR is making a clear statement with this watch that might provoke an instant deal maker/deal breaker reaction. Unlike the hand wound military field watches of yesteryear, the Venture features a reliable and tough ETA 802.102 Swiss quartz movement. Now before you immediately stop reading, consider this: Lifetime Warranty & $99 USD pre-order price. The way I see it, the Venture is not going to be the jewel of a watch enthusiast’s collection but it’s a tremendous candidate for the position of beater or “shaving kit watch” (as James & Jason of thegreynato would call it). BOLDR is proposing a set-and-forget watch that is equally suited to handling the unrelenting punishment of daily wear yet at such an accessible price point that the Venture could easily be a back-up watch to slip in your shaving kit when traveling and is ready to go when your more valuable, sentimental or fragile watch is just not suited for the day’s activities. What about that Lifetime Warranty? Sounds more like a challenge to me. The Venture comes with the BOLDR Tough Enough Lifetime Warranty, a replacement program for parts, components or the whole watch. Should a Venture break or be severely damaged in any way, BOLDR will accept the pieces in return for a brand new watch (for a small fee). This is to demonstrate BOLDR’s belief in the durability of the Venture and challenges wearers around the world to give destroying it a good try! The field watch is a tried and true design that carries on the legacy of timepieces worn in the heat of battle in WW2 and its rugged no-nonsense design was adopted by hikers, climbers and adventurers in need of a vital tool that thrived in adverse conditions. 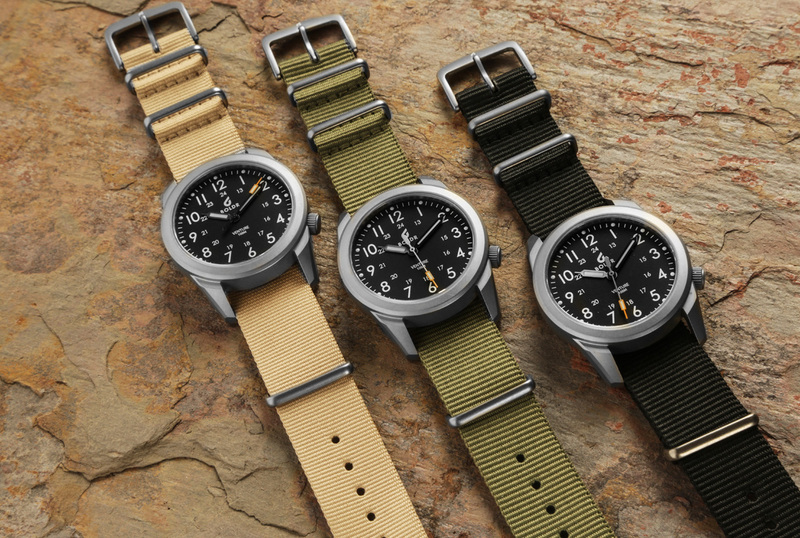 Despite its daring history, the utilitarian minimalism and robustness of the field watch’s design means it is as relevant and practical today as something that just works. 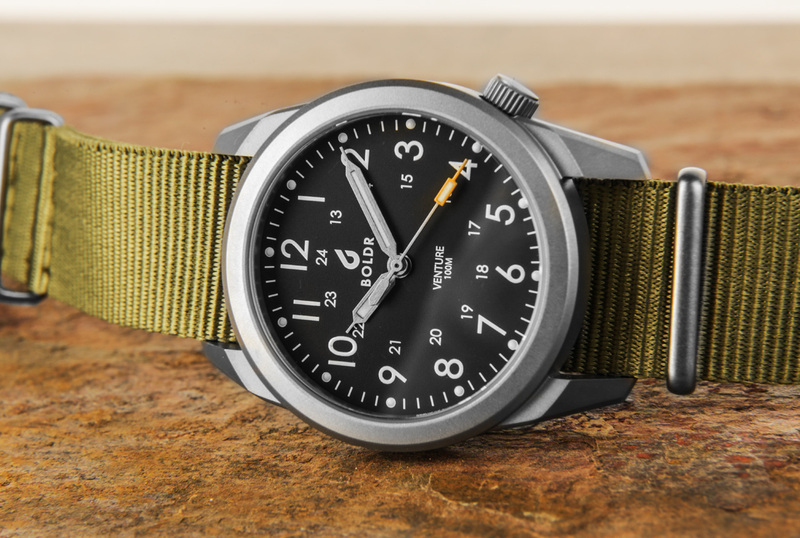 BOLDR Supply Co has created a watch that is inspired by tradition while taking advantage of modern materials for better performance and value. The BOLDR Venture launches on the BOLDR Workshop on October 1st 2018, and is expected to ship by November 2018. It will retail at $169 USD but will be available for a one-month pre-order price of $99 USD. More details on the BOLDR Venture will be made available on the BOLDR website from October 1st onwards.